Some History. AGREA was formed in the Fall of 1987 to conduct "scenario analyses" designed to assist multi-stakeholder advisory groups develop a shared understanding of prospective long-term, robust, cost-effective and environmentally-responsible portfolios of electricity technology and policy options. Yes, a mouthful. But then multi-decadal evolution of energy infrastructures is a very busy topic, with many stakeholders—and their respective institutions—playing critical roles in developing, implementing, enabling, or blocking various technology and policy options. AGREA (pronounced "agree") was put together by Prof. David C. White (then current and founding director of the MIT Energy Lab - now LFEE), and Prof. Fred Schweppe and Dr. Richard Tabors of LEES (Laboratory for Electromagnetic and Electronic Systems - the former Power Systems Lab), building upon their experience in the early 1980s, helping Consolidated Edison in New York evaluate a broad range of power supply alternatives for New York City. At that time AGREA was created, the New England power industry was suffering from rapidly growing electricity demand, a shortage of generating capacity—including delays getting expensive nuclear units on-line, uncertainties related to a shortage of natural gas supplies and then-new independent power producers, and well as regulatory gridlock. In the mid-1980s many utility generation investment decisions had been challenged on whether they had been "used and useful." Simultaneously, electricity conservation advocates were making a strong case for end-use efficiency programs instead of new power plants. These arguments were being battled out in regulatory siting and rate-making dockets. What was needed was an alternative forum. MIT stepped forward. Tradeoff Analysis. Professors White, Schweppe and Tabors, and the "first three" AGREA graduate students Clint Andrews, Carl Bespolka and Steve Connors built upon the multi-scenario approach of the ConEd study, and developed "Scenario-Based Multi-Attribute Tradeoff Analysis" methodology. Called Tradeoff Analysis for short, the methodoloy—or framework for analysis—brings together stakeholders and the researchers, and from these discussions a set of scenarios is generated, as well as the population of performance metrics—or attributes—by which scenario performance will be judged. Using the best available data and models, the scenarios are analyzed. 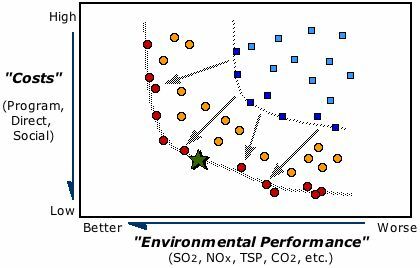 The results are presented to the stakeholders using pairwise "tradeoff plots" (illustrated above). Both inferior and superior portfolios of options (strategies) are easily identified, and across various combinations of uncertainties (futures) for the attributes of principle intererst. Multiple scenario sets allow the group to identify even better (lower cost/lower emissions) strategies. For a good example of the Tradeoff Analysis approach in action see Chapter 6 of The China Energy Technology Program (CETP): A Framework for Decision Support in the Electric Sector of Shandong Province (eds. Eliasson and Lee, Springer, 2003) or download a draft version of the Electric Sector Simulation chapter HERE. AGREA originally stood for the the "Analysis Group for Regional Electricity Alternatives." However given the broader scope of AGREA's research in recent years (see project pages), in the Spring of 2005 acronym was changed to "Energy Alternatives." See the links along the left to see details about past and present projects, key insights, and some of the names and faces involved in AGREA research over the past seventeen years.